Annan Athletic deservidly lifted the points against promotion candidates Edinburgh City with an excellent energetic display to dent City’s push for the title. It was super victory for the Galabankies which was fully merited and retains Annan’s push for play off place. Manager Peter Murphy was once again forced to make changes with on loan Rangers player Kyle Bradley being unavailable due to an injury received while playing a mid week friendly match for the Glasgow side. Ayrton Sonkur replaced Hooper at the centre of the Annan defence with Scott Hooper taking over the role normally taken by Bradley in mid field. Within 15 minutes Sonkur had to leave the field after sustaining an injury to his ankle meaning a return to the centre of defence by captain Peter Watson. The opening minutes were frantic with Hooper clearing Shepherd’s effort off the goal line following a corner kick and at the other end Moxon rifled a shot over the bar followed by an Aidan Smith effort which failed to hit the target. Chris Johnston then missed a golden opportunity when the ball appeared to get stuck between his feet with the goal at his mercy. It was a promising start by Annan then at the other end Mitchell tipped over Balatoni’s header from a corner kick. Watson then came on for the injured Sonkur. Mitchell then had to deal with a routine Graham Taylor effort. The game was flowing from end to end, Aidan Smith then tested Antell with a well struck shot. Moxon then made a penetrating run down the left finishing with an inviting ball into the path of Smith who blasted the ball over the bar. Annan were enjoying a good spell in the match and Watson came close with a header from a Chris Johnston corner kick with keeper Callum Antell pulling off an important save. At the other end Annan averted a dangerous situation by catching the Edinburgh side offside. As the half progressed City then went ahead after Shepherd won a penalty kick. The dangerous City forward forced Watson into a tackle on the bye line with the tackle giving the Referee a decision to make and a penalty was awarded with Blair Henderson tucking the ball into the corner of the net to give City a very welcome lead. Annan finished the half once again taking the game to City with Johnston continuing to be a menace down the right flank as he was all afternoon. Annan started the second half where they left off the first taking the game to City and within a minute they struck gold with a stunning 22yard volley from David Wilson which left City keeper Callum Antell rooted to the spot as the shot flew into the top corner of the net. It was a goal fitting to win any match but it got Annan back on level terms. The goal gave Annan the impetus and they continued to cause alarm down the right flank. Muir was then booked for what appeared like a fair challenge on keeper Antell as the Annan striker and the keeper challenged for the ball. 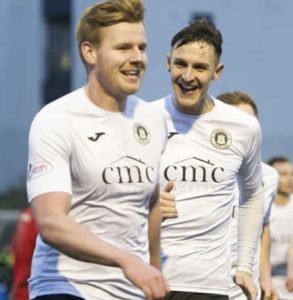 Annan then had a scare in the 60th minute when Swinglehurst had to leave the field with an ankle injury but the dominant centre half made a welcome return minutes later. Moxon won a free kick in the edge of the box as Annan pressed forward to try and get their noses in front. At the other end Mitchell dropped a high cross ball to present a half chance to the home team but the opportunity passed and City failed to take advantage. The play then switched to the other end as Annan forced a couple of corner kicks and from the second corner kick it was ex Annan striker Blair Henderson under pressure who headed the ball over his own goal line to give Annan a slender but well deserved lead in the 74th minute. As the match entered the final minutes City pressed hard for an opening and it took a super block from Scott Hooper to deny Robbie McIntyre in the 84th minute. As City pressed forward it left them exposed at the back and Moxon then headed into keeper Antells hands. All in all it was a very entertaining match with Annan winning for the first time against the teams above them , the defeat is a dent to City’s title aspirations and the victory leaves Annan in with a chance of the fourth play off place. One final word the equalising goal scored by David Wilson was an absolute screamer and fitting for any goal of the month award. Annans next task is to try and repeat the performance against Top of the table Peterhead at Annan next Saturday. ANNAN ATHLETIC- Alex Mitchell, Scott Hooper, James Creaney, David Wilson, Arton Sonkur ( Peter Watson 15 min ), Steven Swinglehurst, Owen Moxon, Ryan Sinnamon, Aidan Smith, Tommy Muir, Chris Johnston. SUBS NOT USED- Aidan McCadams, Ross Ferguson, Tony Wallace , Lewis Strapp, Peter Murphy. With the Scottish Cup taking centre stage at the week end there was only another 2 SPFL matches played. Peterhead moved back to the top of the table with a 2-0 victory over Berwick with the second goal coming in injury time and Queens Park and Stirling Albion had to be content with a share of the points in a 1-1 draw at Forthbank.